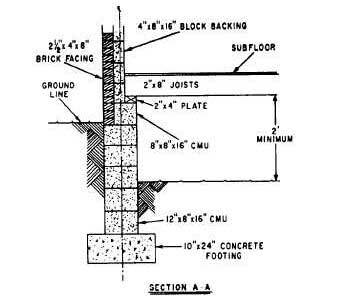 Figure 2-16.A typical section of a masonry building. Home > Construction Training Manuals > Builder 3&2 Volume 01 > Figure 2-16.A Typical Section Of A Masonry Building. Figure 2-16. - A typical section of a masonry building. information that cannot be given on elevation or plan views. Sections are classified as typical and specific. Typical sections represent the average condition throughout a structure and are used when construction features are repeated many times. Figure 2-16 shows typical wall section A-A of the foundation plan in figure 2-10. You can see that it gives a great deal of information necessary for those constructing the building, Lets look at these a little more closely. The foundation plan shown in figure 2-10 specifies that the main foundation of this structure will consist of a 22- by 28-foot concrete block rectangle. 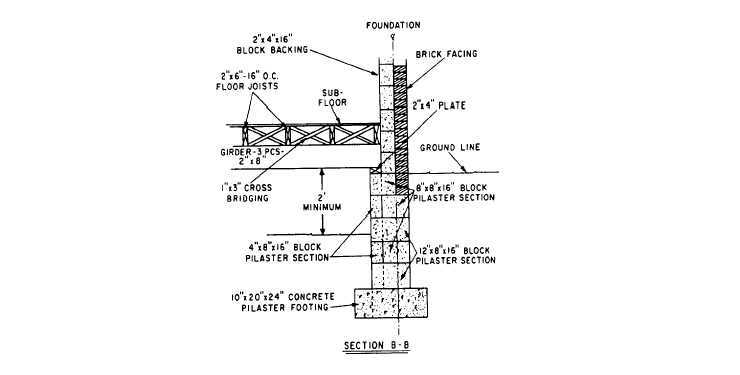 Figure 2-16, which is section A-A of the foundation plan, shows that the front and rear portions of the foundation (28-foot measurements) are made of 12-by-8-by-16-inch CMUs centered on a 10-by-24-inch concrete footing to an unspecified height. These are followed by 8-inch CMUs, which form a 4-inch ledger for floor joist support on top of the 12-inch units. In this arrangement, the 8-inch CMUs serve to form a 4-inch support for the brick. The main wall is then laid with standard 2 l/2-by-4-by-8-inch face brick backed by 4-by-8-by- 16-inch CMUs. Figure 2-17. - A specific section of a concrete masonry wall.